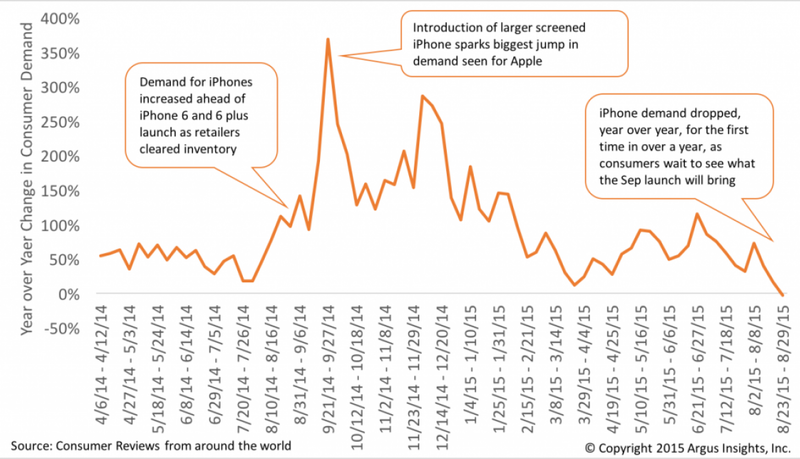 Apple is set to release its latest iteration of the iPhone on September 9th, along with a few other ‘surprises.’ This release is scheduled amid saturation in the market, leaving us with the question: how much demand is still latent in the market for the 6S…or whatever designation Tim rolls out on the stage? We’ve already seen Smartphone demand slack tremendously this year, impacting Samsung and the entire China market as consumers hold on to ‘good enough’ handsets. So, will this fall be Apple’s last bumper crop of iPhones? Or has the market fallen too far from their tree of Heart’s Delights? At Argus Insights, our reading of consumers matches public comments by CEO John Feland earlier this year, that Apple has one good cycle left in them, barring any earth shattering innovations. iPhone 5S and 5C users were pulled into the upgrade cycle two years ago, and are now hungry for the bigger, bolder iPhone rumored to be launched on September 9th. Additionally, Android users who were still locked in during the iPhone 6 and 6 Plus launch last year, and those disappointed by the recent ‘Pengazi‘ issues with the Galaxy Note 5, are also likely converts to whatever handset Apple chooses to share with the world. As such, this fall and coming holiday season will be very big for Apple. Not as big as last year, but large when compared to the falling fortunes of most of their big competitors. Unlike Cher, this upcoming round of iPhones is likely to be the iPhone’s Farewell tour. Market demand of future handsets will not be as high because the innovation pipeline has apparently run out of good (compelling enough for consumers to upgrade) ideas. iPhone sales are unlikely to hit the same peaks at next year’s upgrade cycle as the level of smartphone saturation tips to replacement over new users. Argus Insights is founded on the fact that mindshare anticipates demand. Through curated analysis of global consumer reviews and social media conversations, the firm provides comprehensive visibility at market, product, and attribute levels to determine what is delighting and disappointing the market. Customers take action on our insights to deliver better products, more impactful launches, create forecasts, perform competitive analysis, and track events and analyst relations. Take action today, schedule a free market fit assessment.